Historically speaking, the advent of autumn signifies a time of bounty – to take pride in one’s harvest, and prepare diligently for the leaner months ahead. With so many indulging in all things pumpkin-flavored and scented at this time of year, one may forget that this week marks the midpoint of the semester; October will soon give way to November, November to December, and at last our nightmare (er, semester) will be finished. Of course, it’s only normal for students to start getting increasingly nervous over how much (or little) we’ve studied for classes, as other priorities fight for our attention. I too am no different. I recently became an uncle for the second time in as many years, and for the life of me I just can’t help myself daydreaming in class about how frickin’ adorable my nephew will be when I meet him for the first time. Alas, I must carry on. And so should you. After all, we don’t pay in Monopoly money to attend college. In the meantime, there is plenty to occupy the next few weeks, besides procrastinating via Netflix. In this issue, readers can get a healthy sampling of arts and culture, as one of our writers gives us insight on the physically demanding – yet emotionally rewarding – skill of dance. In addition to live spectacle, however, another aspect of performing arts is examined: a sneak peek of the upcoming documentary Katsu Goto. This project is being spearheaded by two of UH Hilo’s finest: Patsy Iwasaki and Jacquelyn Pualani Johnson, the latter of whom helped cast student actors for the film. 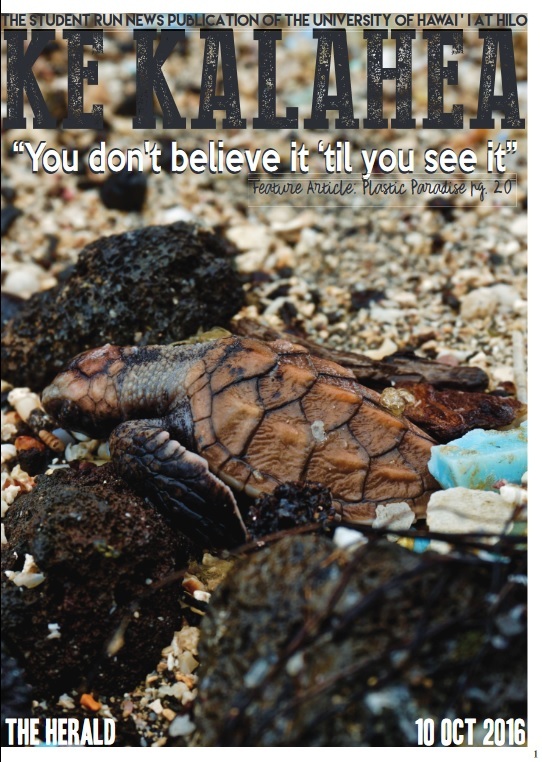 Ke Kalahea and the UH Hilo community eagerly await the release of this riveting story. In other news, tomorrow marks the 28th anniversary of National Coming Out Day, which serves as a time to celebrate the simple truth: love is love. A student contributor, Sadie, shares some thoughts on what it means to be a part of the LGBTQIA+ community. Unfortunately, in too many situations, acceptance of our fellow humans is still a work in progress. That’s why one of our writers decided to speak with UH Hilo’s Danzan Ryu Jiu Jitsu Club, which is currently offering a self-defense class at the Student Life Center this Saturday. As a University ‘ohana, whether times are good or bad, we are there for one another. Student-athletes exemplify this best, as demonstrated by the compelling stories of Lindsey Poulsen and Jordan Kurokawa. Student solidarity is in force even off-campus; one of our photographers, Adrienne, witnessed this firsthand as she and other students volunteered to help clean up a beleaguered Kamilo Beach. Lastly, Ke Kalahea gets to deliver a scoop that doesn’t come often: one straight from the Chancellor himself. Indeed, UH Hilo’s Don Straney recently spoke to Ke Kalahea and other members of the media on the future of the University. Outlining his thoughts, one certainly gets a clearer vision for how he thinks we can be more innovative and successful - ultimately solidifying our brand as a comprehensive, four-year university uniquely positioned in the midst of the vast Pacific. As always, we appreciate your continued readership, and look forward to bringing you more relevant stories on UH Hilo, our island community, and beyond. And remember: our doors are open to you, and so are our ears!